Make sure your plastic card is clean and not greasy. Sand some rust off your object, the resulting lumps should be fine and not great bit lumps. You are aiming for about a quarter of a teaspoon of rust dust. 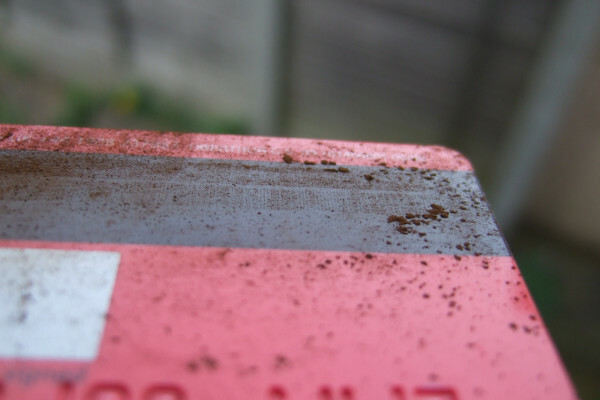 Pour the rust dust over the magnetic strip, you want to completely cover the strip. Now tap off the excess rust. Look at the reflection of a uniform white light source, like the sky or a fluorescent tube, in the magnetic strip. If you get it right your should find that the rust sticks to the magnetic strip in lines. Unsurprisingly the magnetic strip on a credit card stores its information magnetically so areas of the strip will be magnetised, which stores the data on the strip. When you swipe the card through a reader small currents are induced in the reader, which are interpreted as the card number etc. Although the brown Fe2O3 rust is non-magnetic black FeO is magnetic and makes up Haematite and Magnetite ores, and so are any particles of iron attached to the rust. This means that the fine particles will stick to the magnetic parts of the strip, allowing you to see how the data is encoded. Different strips will have different arrangements of lines to encode the different numbers.